The tricarboxylic acid (TCA) cycle is one of the most important metabolic pathway for cellular respiration in aerobic organisms. It provides and collects intermediates for many other interconnecting pathways and acts as a hub connecting metabolism of carbohydrates, fatty acids, and amino acids. Alteration in intracellular levels of its intermediates has been linked with a wide range of illnesses ranging from cancer to cellular necrosis or liver cirrhosis. Therefore, there exists an intrinsic interest in monitoring such metabolites. 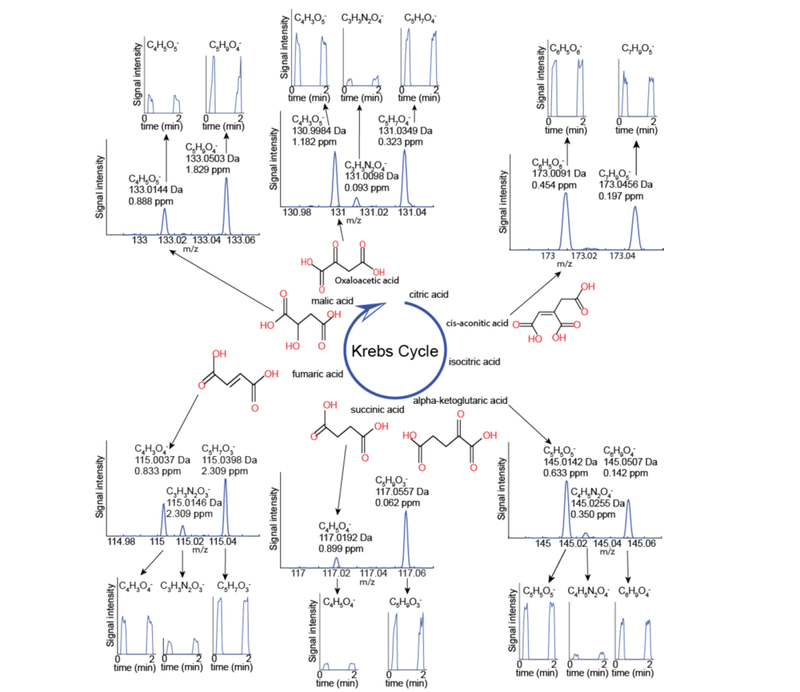 Our goal in this study was to evaluate whether, at least the most volatile metabolites of the TCA cycle, could be detected in breath in vivo and in real time. We used secondary electrospray ionization coupled with high-resolution mass spectrometry (SESI-HRMS) to conduct this targeted analysis. We enrolled six healthy individuals who provided full exhalations into the SESI-HRMS system at different times during 3 days. For the first time, we observed exhaled compounds that appertain to the TCA cycle: fumaric, succinic, malic, keto-glutaric, oxaloacetic, and aconitic acids. We found high intraindividual variability and a significant overall difference between morning and afternoon levels for malic acid, oxaloacetic acid, and aconitic acid, supporting previous studies suggesting circadian fluctuations of these metabolites in humans. This study provides first evidence that TCA cycle could conveniently be monitored in breath, opening new opportunities to study in vivo this important metabolic pathway.